Inventory We are a resale marketplace, not a box office or venue. Ticket prices may exceed face value. This site is not owned by James Brown Arena . 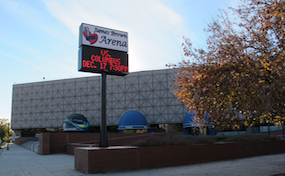 The James Brown Arena opened back in 1974 as the Augusta-Richmond County Civic Center. The James Brown Arena box office is located at 601 7th Street in downtown Augusta, Georgia. The venue was constructed for $11 million and has a maximum seating capacity of 9,167. The arena was renamed in 2006. James Brown Arena tickets have included acts like Elton John, Rush, Bob Seger, Van Halen, Bon Jovi, and many more. Everything in Augusta plays second fiddle to the vaunted Augusta National Golf Course. But if you are going to have a second chair in this band the James Brown Arena is a pretty good option to have. JamesBrown.ArenaAugusta.com is not currently affiliated with any official website, box office, or primary supplier. We are an independently owned and operated company that concentrates in all online sales in the secondary ticket market. To order tickets to all James Brown Arena Augusta events please follow the steps through checkout or call our operators at anytime.